The Rule tab is used to set the rule ($Rule) action of notes, adornments and agents. The main input box is used for adding or editing the action code. Pressing the Return key commits any changes made and runs (or updates) the query. 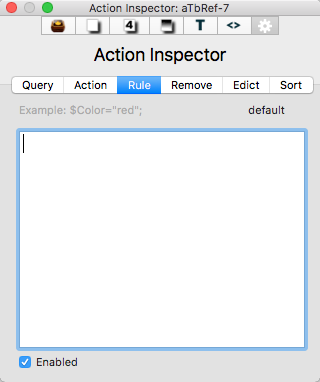 The code box has auto-completion for action code and attribute names (based on using a $-prefix). inherited. Uses an inherited (prototype) value. (no caption). The rule is set locally in the note. Enabled. This toggles disabling of the rule ($RuleDisabled). When un-ticked the rule's code is not evaluated as part of the rule cycle.